E-Filing or Electronic Filing is the process of submitting income tax returns online with ease. This skips the tedious way of going to the Income Tax Department Office to file returns physically. The main advantage of Income Tax eFiling is that one does not require a hardcopy of any document and is free of cost. 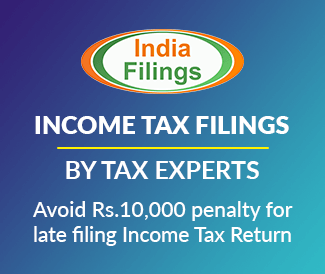 For an individual to file their Income Tax Return (ITR), it is essential to register themselves on the Indian Tax Department’s e-Filing portal. The registration process is quick and easy. In this article, we look at the procedure for completing income tax efiling registraiton. 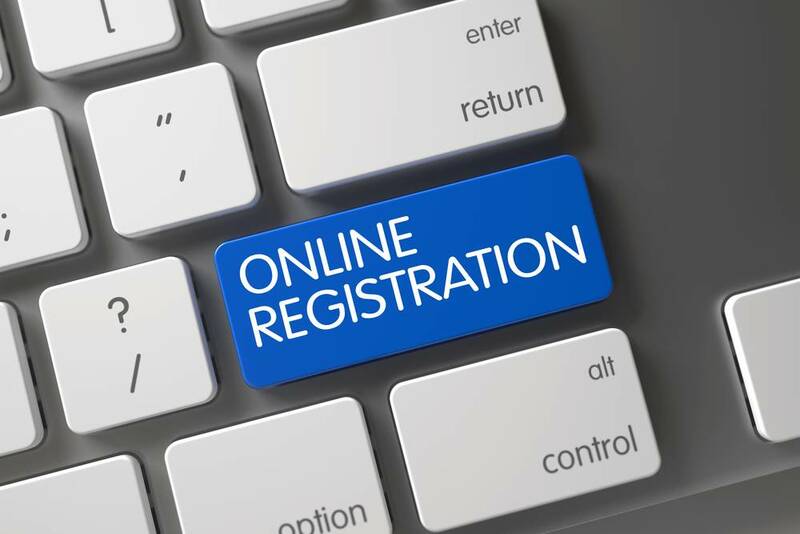 It is mandatory to register and file income tax return online if either of the following conditions applies to an individual, as stated in the Income Tax Act. Individuals, below the age of 60, earning a gross annual income more than INR 2.5 Lakhs. Individuals, above the age of 60, earning a gross annual income more than INR 5 Lakhs. Individuals who earn an income other than salary such as house property, etc. Individuals who want to claim an income tax refund. Individuals who wish to apply for a visa or any loan applications. A company or a firm, irrespective of their profits or losses. Individuals who earn from or have invested in any foreign assets. One must ensure that they have the required documents in hand before starting the registration process on the Income Tax portal. The following documents and details are mandatory for a successful registration. Step 1: Visit the Income Tax Department Portal. 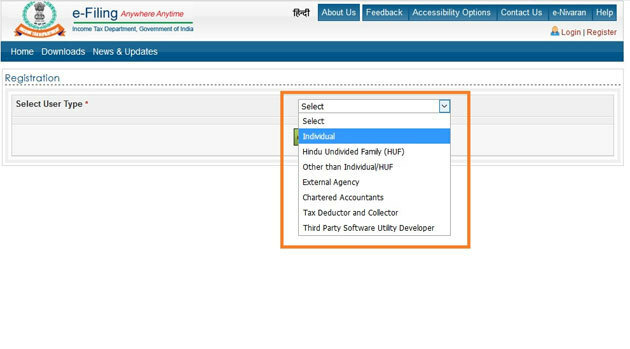 Step 2: After the page has been completely displayed, click on the Register Yourself option on the top right-hand corner of the homepage of the government portal. Step 3: For the next page, the user will be taken to the registration form. Step 4: Here, the user would have to select the appropriate option from the list under the tab Select User Type. 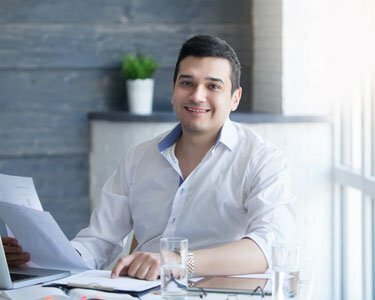 Available options are Individual, Hindu Undivided Family (HUF), Other than Individual/HUF, External Agency, Chartered Accountants, Tax Deductor and Collector, and Third Party Software Utility Developer. Step 5: After the option is selected, click on the Continue tab. 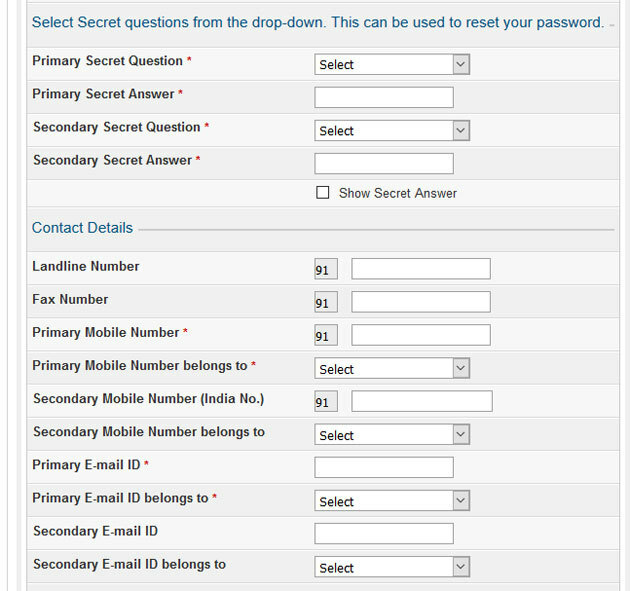 Step 6: The following page would display the Registration form for the option selected. Here, the option chosen is Individual. Step 7: Enter the necessary details such as the following in the registration form. Date of Birth as mentioned on the PAN card. Step 8: Click on the Continue icon after all the fields marked with an asterisk sign are filled correctly. Step 9: The next page would require the user to submit details such as the following. These details must be filled precisely as the Income Tax Department would be using the same information to reach out to the user via SMS/ emails etc. Along with these details, the user will be required to choose two secret questions for security purposes, and in case the user wants to reset the password of their account. Once the required fields are completed in the registration form, click on the Continue tab. Step 10: The user would be required to verify their registration to complete the process. A one-time password (OTP) would be sent to the mobile number and email address that was submitted on the registration form. Once the OTP and mail are received, the user has to click on the link to register themselves successfully on the Income Tax e-Filing website. Note: For non-residents, the OTP would be sent on the registered email address. Note: The OTP would expire after 24 hours from the time of receipt, and therefore, the registration process would expire as well. In case of failure to complete the registration process within 24 hours, the registration must be initiated from the beginning again. Step 11: The user would be successfully registered on the Income Tax e-Filing portal. 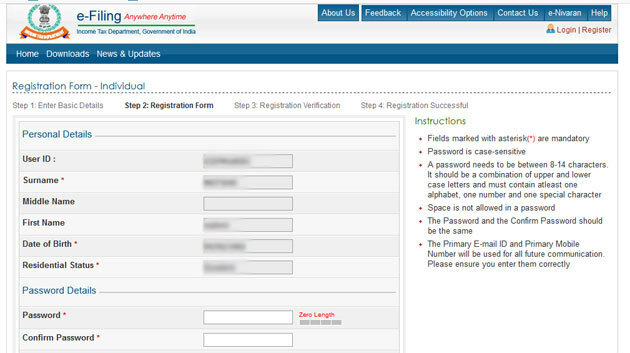 After the user has successfully registered themselves on the portal for e-Filing, the user may log in to their account. Given below is a step-by-step process to log in to one’s account. 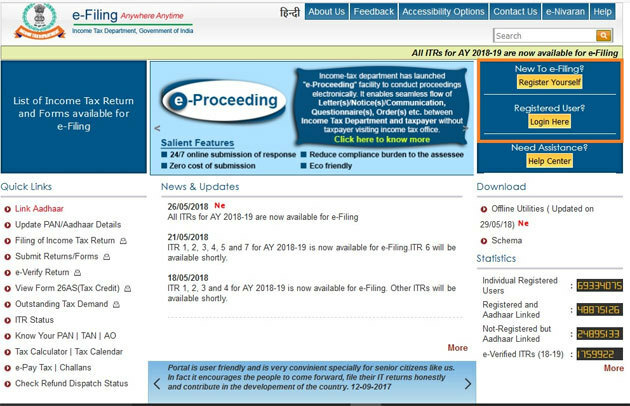 Step 2: Click on the Login Here tab placed on the top right-hand corner of the Income Tax login page for registered users. Step 3: Once the tab is clicked, the user will be taken to the login page. There, the user has to enter in their Username and Password that they set during the registration process. Along with those details, the Captcha Code would be required to log in to the account. 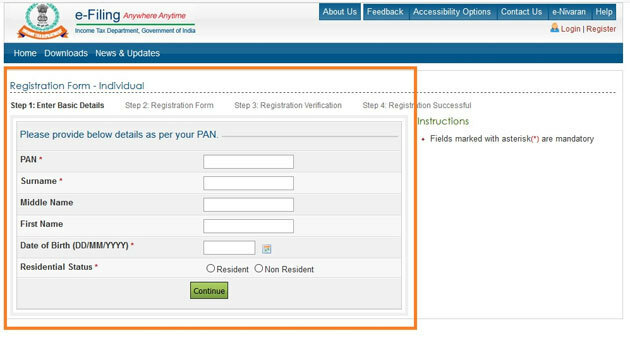 Note: For Income Tax Login, the User ID of a user would be their PAN Card Number. A registered user may also access their account via Net-Banking. For this facility, the registered user must be a registered Net-Banking user.